12 hot desks for half day, daily or weekly rental in an open plan environment. 100mb broadband included in your rental price. Free on street or rear car park. Access to communal spaces, roof top balcony and break out areas. 10 seat boardroom and smaller meeting rooms for short term rental. 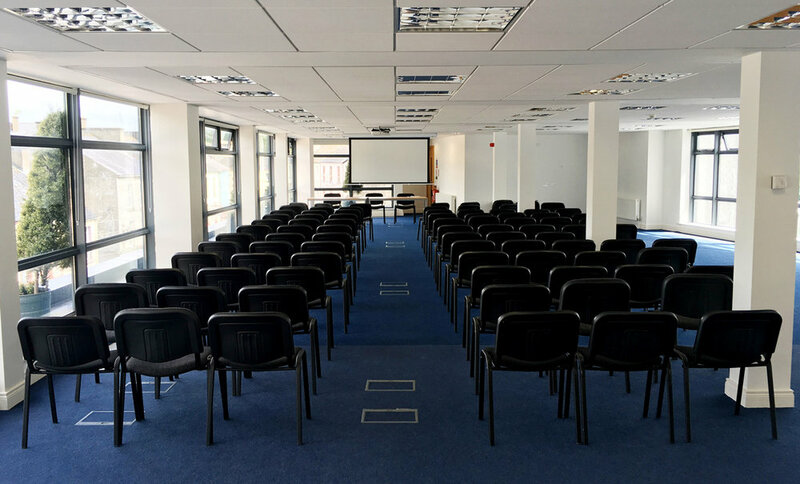 100 seat modern and bright conference facility with audio visual equipment and roof top balcony area and seperate kitchen. Mail box and address rental facility. Longer term office suites for established or start up businesses. Lockers for those who want to keep their files on site. Free on site modern canteen with unlimited supply of tea and coffee. Serviced front office desk with secretarial support. Secure key fob access to the building. Monitored security camera system inside and out. A number of Hot Desks are available for half day, daily or weekly rent. Prices start at €25 with discounts available for those who would like to commit to more regular usage. Co Working Desks are also available that may suit start up or established companies or individuals who can not afford to commit to long leases, paying exorbitant rent or large deposits. Seperate office suites are also being constructed to suit those who would like to be part of the Spool Factory community and environment but prefer a more private work space. All users share the one canteen and chill out area, making networking a high priority in the Spool Factory. The Spool Factory Event Centre is situated on the top floor of the building with panaromic views all over Boyle from the floor to ceiling glass walls. The facility can seat 100 people theatre style in a bright, open and what has been refereed to as a "relaxed environment". With state of the art audio visual equipment and 6ft electronic screen, black out blinds on every window ensure privacy when needed and no glare when using the visual equipment. On site facilities include 100mb wifi throughout, toilets, canteen, roof top balcony and lift access. Catering can also be provided if required. A 10 seatfully equipped, bright boardroom with 60 inch conference screen is also available in the building as are smaller meeting rooms for less formal gatherings. Boyle's central location - close to Ireland West Airport, 2 hours from Dublin and 25 minutes from Sligo - makes the town and the Spool Factory the ideal location for your next conference, training event or corporate gathering.